Co-founder of influential alt-country rockers Uncle Tupelo and front man for Son Volt, Farrar has one of the most impressive resumes you'll ever come across. He's influenced countless musicians and will be forever remembered at the very least for his contributions to alt-country through Uncle Tupelo and Son Volt. The big question is, how do you step back from all that success, go solo, and not collapse under the pressure? If you're Farrar, you release one of last year's finest singer-songwriter albums, Sebastopol, tour relentlessly, and hit the studio again and record an EP. 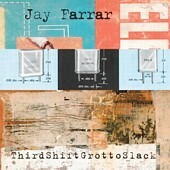 The EP, ThirdShiftGrottoSlack, continues on with Farrar's reputation for solid, well-written country-folk inspired pop-rock songs. Songs that are as much from the heart as they are from the head, blending a nice mixture of delicate pop, dusty country, and folk-rock to make you want to always come back for more. Farrar is in fine shape here, with no signs of tiring. This is a prime example of a great songwriter that can constantly re-create himself, deliver something good, and move on, avoiding the traps that plague so many veteran songwriters. I'll give this an A-.